This weekend, I spent some time thinking about what I wanted to plant in the Spring. Winter is a great time to spend planning the upcoming garden. I started collecting some of the seeds. I am hoping my vegetable and herb garden will be more successful than 2014. 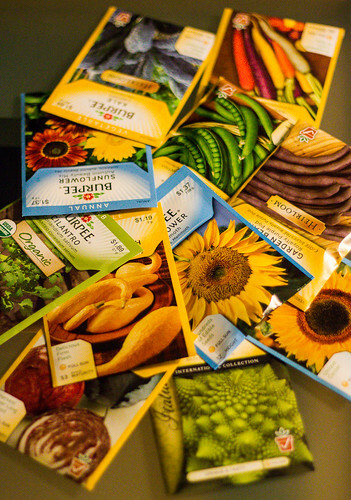 I want to plant a sunflower garden this Spring. They are fun plants to look at. I picked a few varieties from four to twelve feet tall. I hope it will add some nice visual interest. I bought some peas to climb up the bigger ones too and some squash to provide some shade/ground cover. For veggies, I like to grow things that are unusual and not something easy to get at the farmers market. This year I picked some unusual varieties of bean, carrot, broccoli, kale, and cabbage.